If you smell fuel when you are driving down the road, notice a puddle below the tank when you fill up, and it seems your gas hand is falling a lot faster than it once did, these are signs that you are dealing with a fuel leak—which is never a welcome problem. Not only can fuel leaks be an expensive problem because you are essentially putting fuel in the tank which never gets used, fuel leaks can also be incredibly dangerous. If you suspect you have fuel leaking from your vehicle, it is a good idea to get to know the symptoms and likely causes. Problem: You notice leaking fuel only when your tank is completely full. Cause and Solution: The most likely cause of fuel leaking only when your tank is full is a deteriorating gas tank. Because of the flat-top surface of most gas tanks, moisture (and even fuel) pooled on top can cause corrosion over time. Unfortunately, this kind of issue usually means the tank will have to be removed and replaced, which can also involve removing several other components, such as fuel lines, regulators, and the fuel pump. Problem: You smell fuel fumes coming from beneath the hood. Cause and Solution: Fuel-injected motors have fuel injectors that push fuel to the pistons where it is transferred into power. While fuel injectors rarely fail, the rubber seals they have inside can. 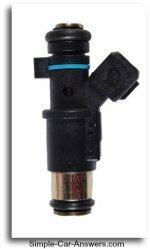 A leaking fuel injector will not be enough of a leak that you notice a huge difference in fuel usage, but you will notice a telltale odor when your engine is running. Pop open your hood and look around the fuel injectors, which are located near the intake manifold. If you find spots of fuel, it means you need to have your fuel injectors either replaced or fitted with new seals. Problem: You notice fuel spraying out beneath the vehicle. Cause and Solution: Perhaps the most alarming sign of a fuel leak, gasoline spewing onto the ground under your car at random intervals is bound to bring about worry of a big problem. Even though this is a big deal, the fix is actually usually a simple one. If fuel is spewing from somewhere beneath your vehicle, take a look to see if you see a rubber line leaking. Fuel lines leading from the gas tank to the engine are pressurized to move the fuel where it needs to be. Therefore, if one of these rubber lines gets damaged or punctured, you will not just see fuel dripping, but spraying out. Thankfully, replacing a fuel line is not only an inexpensive feat, it is usually a relatively quick repair for your mechanic.